https://icv2.com/articles/markets/view/38060/top-5-roleplaying-games-spring-2017 right under D&D and Pathfinder. https://www.gamenerdz.com/star-wars-the-roleplaying-game-30th-anniversary-edition-preorder is a bargain at $47.97. Shipping is only $3 (at least that’s what comes up for me), or free if you order two sets. Posted: Tue Mar 13, 2018 12:08 am Post subject: [FFG] WEG SW:The RPG 30th Anniversary Edition! Good deal! 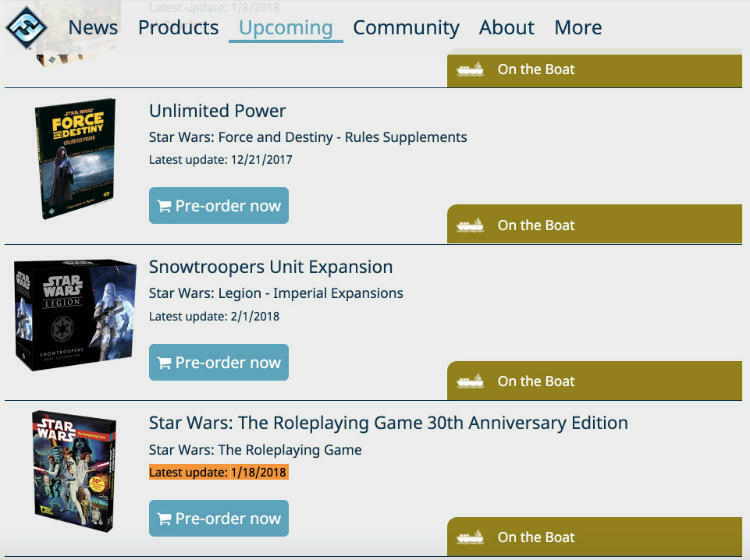 FFG's upcoming products page has had it's status as "on the boat" since 1/18, and the best I have been able to gather is that it's expected to be available sometime in March or April. I would so love for this to sell well, and FFG bring out a supplemental line using D6. Ah, we can dream, can't we? Two sellers on Amazon are stating (or gambling) that they’ll have it in their hands by April 10th. Posted: Tue Mar 13, 2018 9:03 pm Post subject: [FFG] WEG SW:The RPG 30th Anniversary Edition! I've been following those on Amazon and the date fluctuates about weekly. I'll get excited when the FFG product status changes from "on the boat". I watched it change for the Dawn of Rebellion book and my FLGS had it the following week. I'm beginning to wonder if the craft that FFG's "On the Boat" status is talking about is in fact the RMS Titanic. Posted: Mon Mar 26, 2018 7:07 pm Post subject: [FFG] WEG SW:The RPG 30th Anniversary Edition! Good one. On Twitter I asked FFG if the "boat" was coming from Mars, and they didn't reply (they had replied to my tweets in the past). Patience, my young padawans. Anxiety is a path to the Dark Side. Live in the moment. Let go your thirst for what you don't have, and take solace in the blessings of the day. Interesting tid-bit from the section on Assassin Droids. They were legal during the Old Republic, and it was Palpatine, by Imperial Edict, that outlawed them. Posted: Fri Apr 06, 2018 4:27 pm Post subject: [FFG] WEG SW:The RPG 30th Anniversary Edition! Is this just a random blurb from original SB or are you reading from the thread's subject product still on the boat? I know there have already been some tangent discussions but let's try to keep this thread about the [FFG] WEG SW:The RPG 30th Anniversary Edition. That's all well and good, BUT I NEED IT! Posted: Wed Apr 11, 2018 12:25 am Post subject: [FFG] WEG SW:The RPG 30th Anniversary Edition! Is the boat the S. S. Minnow? Even they get boarded sometimes. Posted: Wed Apr 11, 2018 7:27 pm Post subject: [FFG] WEG SW:The RPG 30th Anniversary Edition!